There are several design principles which are around us. All focussing on these key principles. 2. Single Responsibility Principle: Each component should be responsible for handling a single feature. 3. Principle of Least Knowledge (Law of Demeter – LoD): A component should not know about the internal details of other components. 4. Don’t repeat Yourself (DRY): The functionality or logic should not be repeated in any other component. 5. Minimise Upfront Design: Only design for what is necessary and don’t exaggerate the services and over design the concepts. This might lead to complexity and excess cost. 1. Client/Server: Segregates the system into two applications, where the client makes requests to the server. 2. Component-Based Architecture: Decomposes application design into reusable functional or logical components that expose well-defined communication interfaces. and defining business objects based on entities within the business domain. 4. Layered Architecture: Partitions the concerns of the application into stacked groups (layers). 5. Message Bus: An architecture style that prescribes use of a software system that can receive and send messages using one or more communication channels, so that applications can interact without needing to know specific details about each other. 6. N-Tier / 3-Tier: Segregates functionality into separate segments in much the same way as the layered style, but with each segment being a tier located on a physically separate computer. 7. Object-Oriented: A design paradigm based on division of responsibilities for an application or system into individual reusable and self-sufficient objects, each containing the data and the behaviour relevant to the object. 8. Service-Oriented Architecture (SOA): Refers to applications that expose and consume functionality as a service using contracts and messages. 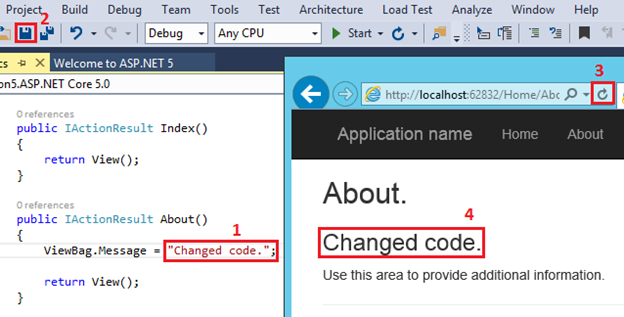 There is one step leap in .NET framework. This new outburst of change-save-refresh-result (CSRR) will change the way the developers tie code. Dynamite Scott has introduced this dynamic feature to our community. I have been asked this question many times by different readers of my blog. They wanted to know about the fundamentals of Web Farms and Web Garden . In this blog post I am going to explain the what is the exact difference between web farm and web garden, what are the advantages and disadvantages of using them. I have also described how to create web garden in different version of IIS. Visual Studio having its own integrated ASP.NET engine which is used to run the ASP.NET Web application from Visual Studio. ASP.NET Development Server is responsible for execute all the request and response from client. Now after the end of development, when you want to host the site on some server to allow other peoples to access, concept of web servers comes in between. A web server is responsible for provide the response for all the requests that are coming from clients. Below diagram showing the typical deployment structure of a ASP.NET Web application with a single IIS. Clients request for resources and IIS Process the request and send back to clients. 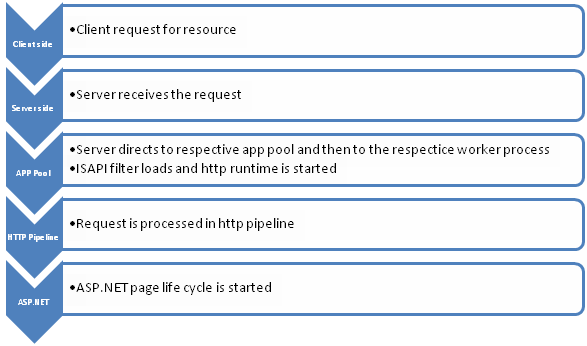 If you want to know more details on How IIS Process the request please read one of my article over “How IIS Process ASP.NET Request ?” . This is the case, where you have only one web server and multiple clients requesting for the resources from the same server. But when there is huge numbers of incoming traffic for your web sites, one standalone server is not sufficient to process the request. You may need to use multiple server to host the application and divide the traffic among them. This is called “Web Farm” . So when you are hosting your single web site on multiple web server over load balancer called “Web Farm”. Below diagram showing the over all representation of Web Farms. In general web farm architecture, a single application is hosted on multiple IIS Server and those are connected with the VIP ( Virtual IP ) with Load Balancer. Load Balancer IP’s exposed to external worlds to access. So whenever some request will come to server from clients, it will first hit the Load Balancer, then based on the traffic on each server LB distributed the request to corresponding web server. These web server may share same DB server or may be they can use replicated server in the back end. So, In a single statement, When we host a web application over multiple web server to distributed the load among them is called Web Farm. Now, let’s have a look, what is Web Garden ? Both the terms sounds same, but they are totally different with each other. Before starting with Web Garden, I hope you have fundamental idea of what is Application Pool and what is Worker Process. If you have already read the article “How IIS Process ASP.NET Request ?” article then I can expect that you have now good idea on both of them. Just to recall, When we are talking about requesting processing with in IIS, Worker Process (w3wp.exe ) takes care all of these. Worker Process runs the ASP.Net application in IIS. All the ASP.Net functionality inside IIS runs under the scope of worker process. Worker Process is responsible for handling all kind of request, response, session data, cache data. Application Pool is the container of worker process. Application pools is used to separate sets of IIS worker processes and enables a better security, reliability, and availability for any web application. Now, by default each and every Application pool contains a single worker process. 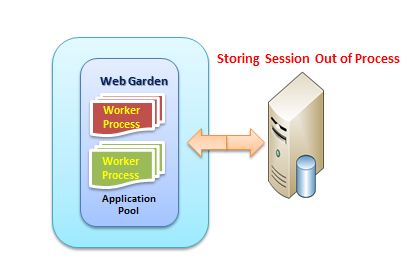 Application which contains the multiple worker process called “Web Garden”. Below is the typical diagram for a web garden application. In the above diagram you can see, on of the application containing the multiple worker process, which is now a web garden. So, a Web application hosted on multiple server and access based on the load on servers is called Web Farms and When a single Application pool contain multiple Worker process is called web garden. 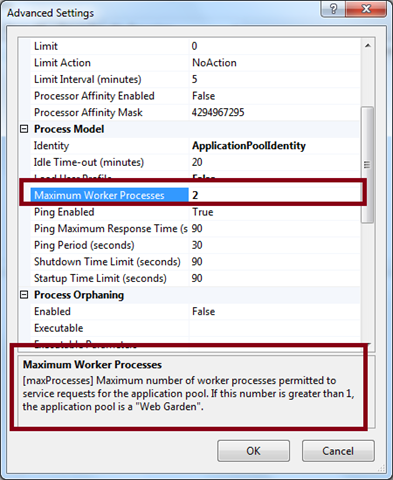 Now, I am going to show how you can change the Number of Worker process In both IIS 6 and IIS 7. For IIS 6, Right Click on Application Pool > Properties > Goto Performance Tab. In the “Performance Tab” Section you would have one option called “Web Garden” where worker process sets to “1”, you can set the number of worker process that you required. For IIS 7, Right Click on Application Pool > Go To Advance Settings > In Process Model section, you will have “Maximum Worker Processes” . You can change it more than 1 to make it as web garden. In the above image you can also check the definition of Web Garden also. Now, let’s have a look in to the advantages of both the Web farms and Web Garden. It provides high availability. If any of the server in the farm goes down, Load balancer can redirects the requests to other servers. Provides high performance response for client requests. Provides Better scalability of the web application and reduce the failure of application. Session and other resource can be stored in a centralized location to access by the all server. provides better application availability by sharing request between multiple worker process. How to manage session in Web Farm Mode ? While using session, requests are distributed among different servers. By default session mode is set to In Proc where session data stored inside worker process memory. But, In Web farm mode we can share the session among all the server using a single session store location my making it Out proc (State Server or SQL Server Mode). So, if some of the server goes down and request transferred to the other server by the Load balancer session data should be available for that request. In the above diagram, you can see we can both the IIS server sharing the same session data which is stored in out of worker process. You can read one of my previous article “Exploring Session in ASP.NET” where I have explained how you can configure session mode for Out Process mode. How to manage session in Web Garden Mode ? When we are using Web garden where request is being taking care by different worker process we have to make the session mode as out process session mode as described earlier. For Web Garden we have configure the out process with in same server but for different worker process. 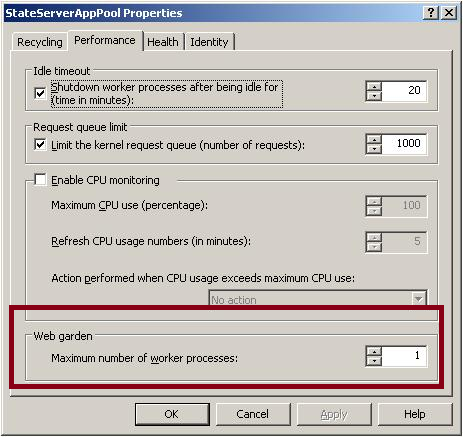 While using Web garden with your application you need do couple of configuration settings in web.config in <process Model> section where you need to set certain properties like cpuMask, RequestLimit, webGarden, ClientConnectCheck etc. Summary : When we host a web application over multiple web server to distributed the load among them is called Web Farm and when One application having multiple worker worker process called Web garden.